my ability to pace myself. What's new? If you find yourself invited to a rooftop lounge party celebrating a new brand of booze, you should always accept. 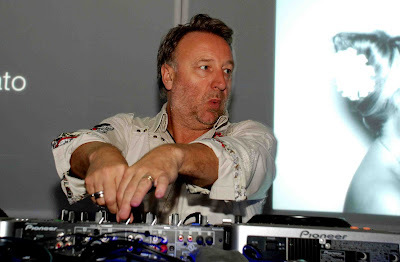 When the invite boasts of the launch Patron’s new vodka, Ultimat, and the celebrity DJ talent is none other than Peter Hook, legendary rocker and bassist for both Joy Division and New Order, you should feel especially inclined. Thus I found myself donning my favorite white sport coat—the party’s suggested attire was summer whites—and heading up to the Peninsula Chicago’s rooftop garden and ballroom for a night of a few too many free cocktails, scantily-clad go-go dancers and loosely transitioned musical selections from a rock icon. Walking from the entry way into the main ballroom the first thing I noted was how much it reminded me of being in Cannes. The Pen is the lap of luxury and channels all that same class as the hotels adorning the coast of the Mediterranean in the South of France. The room was ablaze in a sea of white, with splatters of black and red sticking out due to those in attendance that were “too cool” to adhere to the theme of the party. Generally good looking ladies decked out in skin tight leggings showed off what their mommas gave’em from atop light boxes strategically placed around the room. My date commented on an overabundance of cellulose making itself known on a few of the dancers. Evidently, if dancing is your profession you need to tighten it up. My take on Ultimat—a grain and potato vodka distilled in Poland? Smooth, well-rounded with a tight finish—I almost said tight back-end. With drinks flowing ad infinitum and socialites perpetually queued up for the specialty cocktails on the evening’s menu, Hook pounded out the beats to unanimous positive response. While I wasn’t bowled over by his technical skill, he held his own, mixing it up between trance-tastic anthems, new wave, industrial, a few Underworld tracks and highlights from his own discography. Celebrity DJs are never the best in the bunch but what they lack in skill and finesse they more than make up for in star power. More than once, a fellow onlooker would turn to me in awe and say, “I can’t believe I’m in this room listening to Peter Hook DJ right now.” Obligingly, I found myself unable to do anything more than smile, agree and sneak back to the bar to grab another round of drinks for me and my lady friend.